The Government hopes to put an end to pedestrians recklessly joy-riding on the nation’s footpaths. 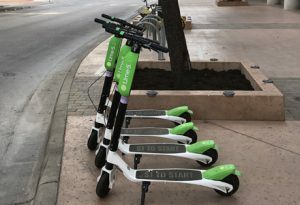 Ongoing safety concerns around Lime scooters in the streets of Auckland and Christchurch have today prompted a promise of action to prevent inevitable injuries and deaths attributed to the new technology. Complaints have been steady ever since the scooters hit New Zealand streets last week, with motorists and pedestrians alike bemoaning the lack of safety regulations around the machines. The Government says it has heard that outcry, and will work hand in hand with local councils to implement new restrictions to protect people from the scooters, by requiring all pedestrians to wear a helmet and other protective gear. “The safety of pedestrians is a national issue,” said Twyford, flanked by associate Ministers Julie Anne Genter and a man pretending to be Shane Jones. “Over the last two weeks, we’ve been aware that Auckland and Christchurch councils have been dealing with complaints from pedestrians who have been hit, narrowly missed, or completely bowled over by people on Lime Scooters. Twyford noted that being a pedestrian was “extremely unsafe,” and that as many as 65 people are killed every year by operating a pair of legs. These dangers called for national regulation of walking, not merely in cities where pedestrians could endanger themselves by getting run down by an e-scooter, but in all towns where people walk. Newstalk ZB’s Mike Hosking was enthusiastic about the move, voicing his approval of the plan in a rare moment of agreement with the not-Labour-led Government. “It’s good to see this government getting down to brass tacks, getting down to business, if you like, finally, addressing a problem that New Zealanders actually care about,” he said on his morning radio show. “Pedestrians are a menace. I’ve always said this. There’s simply too many of them, taking up too much space where there should be cars and the occasional yacht. “If people want to just wander about in cities, getting in the way of my car on those white-striped speeding lines painted vertically across the road, throwing themselves on my bonnet, then they should at least have to take responsibility for their dangerous manoeuvres by wearing safety gear so that I don’t have to pay for so many hospital bills. Hosking wanted footpaths opened to motorists and the installation of car lanes in Myers Park and Aotea Square. The Government is proposing regulation that will require all pedestrians to wear a helmet, shin pads, arm guards, and a cup when more than several feet from their home or driveway. Twyford said the requirements could one day be expanded to indoor environments, given the “incredible” number of accidents that happen in the home. National Party leader Simon Bridges has declined to comment, saying he doesn’t want to be in the news anymore.